So, I wasn’t altogether surprised when I demolished the walls of the kitchen-to-be and discovered some suspiciously crumbly wood. Since termites don’t leave telltale signs of their presence on the surface of the timbers they’re eating, I tapped the post a few times, listening for a hollow sound. I poked the wood with my finger – it plunged right in. Then I grabbed a corner of the post with my fist and watched as it disintegrated into powder. 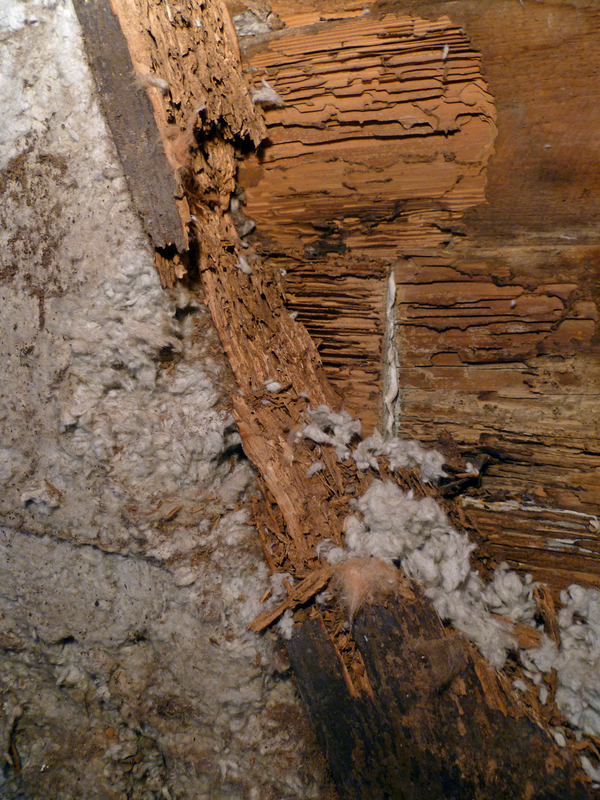 A few gentle taps with my hammer was all it took to reduce the post to a pile of dirty cellulose. After a few moments of abject terror, with visions of collapsing houses playing in my mind’s eye, I evaluated the damage. The good news: the infestation is no longer active and was largely isolated to a diagonal brace that was only structurally critical when the existing kitchen was a freestanding structure. The bad news: in addition to the brace, the little buggers got into the back of the siding boards behind it. I’m not known for my unbridled optimism, but after years of architectural training and practice, I’m conditioned to turning construction’s inevitable lemons into lemonade. The solution to the termite damage is is to completely remove it and put in a window that’s already on our list of “someday” projects. Though the trio of windows in the kitchen-to-be admit a decent amount of light, they’re east-facing which means the room gets limited light late in the afternoon and into the evening. The termite damage is on the west wall in a spot we’d already identified as window-worthy. In addition to late-day light, an opening in this spot will give us views to the backyard. Didn’t realize our backyard had a Rhode Island sea view, did you? It’ll be a trick to figure out where to locate the window. That white beam in the picture continues across the wall on the other side of the post; it’s actually the ceiling beam of the kitchen, down the stairs on the other side of the door. A transom window above the beam might keep the main window from feeling awkwardly low. Clearly, I’ve got some design studies to do. The main reason we didn’t include the window in our original plans was that I wanted to pull a building permit quickly so that we could get the kitchen project underway. Since we’re smack in the middle of the Hillsborough historic district, any change that impacts the outside of our house requires the approval of the Historic District Commission, of which I’m now a member (I hear the boos – don’t hate the player, hate the game). HDC approval requires additional documentation to be submitted in advance of a monthly meeting, and approval must be granted before a permit can be issued. Fortunately, with a building permit already in hand, I can continue working on the the kitchen interior while I prepare for the next HDC meeting. My elementary school art teacher used to say, “mess up, fix up” as a way to encourage us to recognize the hidden opportunities in mistakes we made while working on our noodle art. 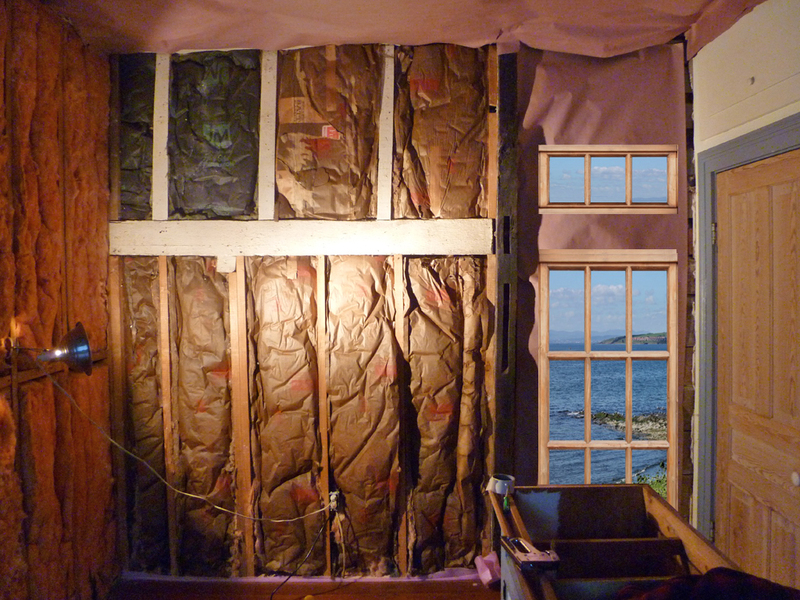 Who knew I’d be putting that lesson into practice 25 years later while restoring a house? If there’s one thing we don’t lack for here at the Ordinary House, it’s critters. Two of them, Meg and Louis, are invited guests. But then there are the squirrels and deer and skinks and snakes and wasps and chimney swifts – all uninvited and badly behaved. Apparently the local fauna enjoys east Hillsborough as much as we do. And now we’ve got another visitor staking a claim to this side of the ‘hood. If I was a betting man, I’d say we’ve got whiteflies. And they’re dripping a sea of honeydew, a word that I formerly associated with tasty white melons, not insect excretion. The stuff is seriously sugary, but might be tolerable if it didn’t provide a breeding ground for black soot mold, a layer of which now coats every plant and horizontal surface of our side yard. 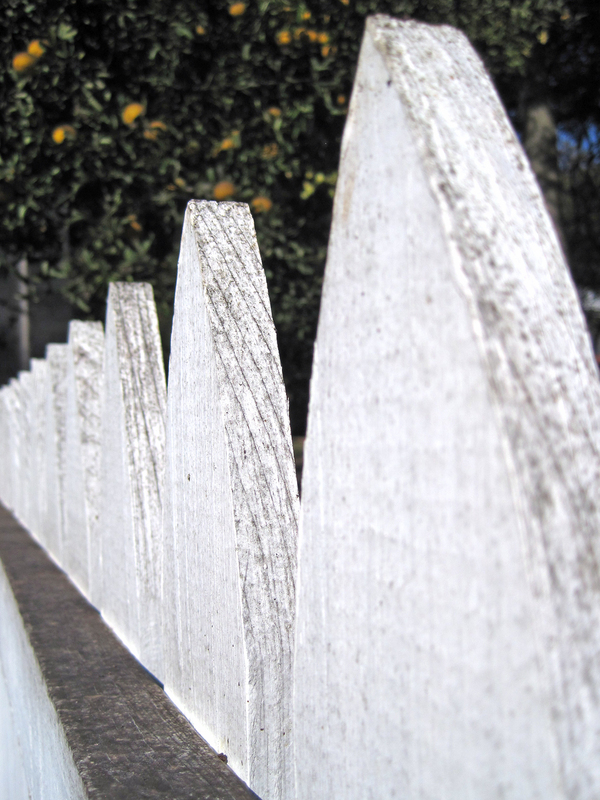 That newly painted white fence? The top rail is nearly black in some spots. 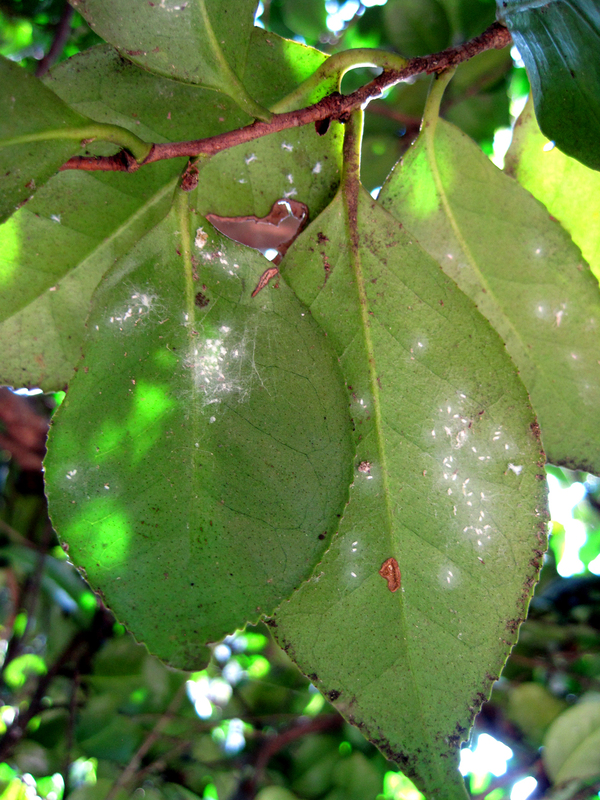 I’m hoping that the cool fall nights will put a damper on the whiteflies’ goo-fest. 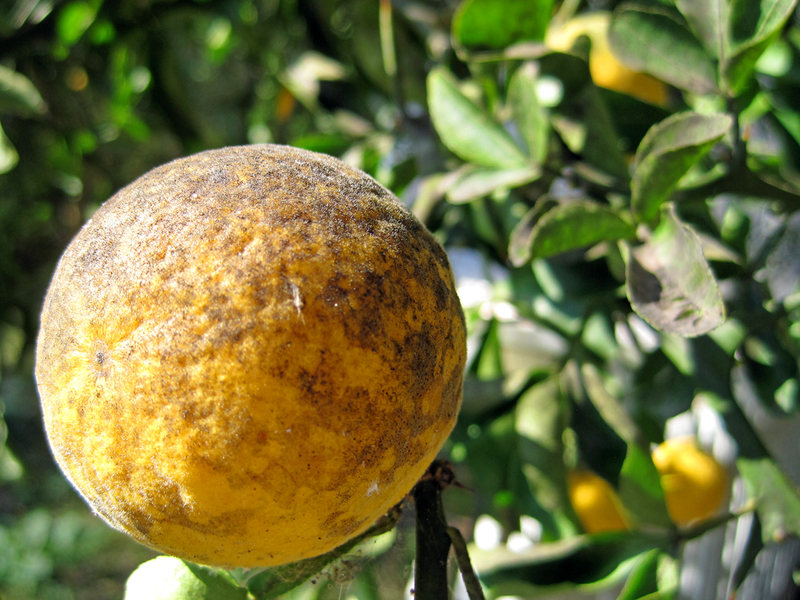 Until then, any tips for removing soot mold or preventing the flies from returning next year? At our neighborhood potluck the other night, someone asked me if we have swifts living in our chimneys. But as the video demonstrates, mama and papa bird have been busy, if you catch my drift. For the past month, every night at dusk, a swarm of our feathered friends dances around the chimney before diving into it one-by-one just as the sun dips below the horizon. As it turns out, this isn’t one birdie family. Apparently swifts gather and roost in large groups just before their migration to South America in the fall. It’s probably mesmerizing and beautiful if that’s not your chimney sitting there in silhouette. Note to self: cap chimneys this winter. If it ain’t rodents, it’s ruminants. Recently, perfectly elliptical patterns of trampled vegetation began appearing in our lawn. It was like a midget UFO was using our yard as its personal landing spot. But, the true culprit was revealed when I pulled into the driveway one evening and a startled deer fawn leaped from the underbrush and sprinted for cover. Unable to jump any of our fences, the fawn paced the perimeter of the yard until its mother appeared at dusk, taking cautious glances at her offspring from the shelter of the neighbors’ trees. I propped a gate open, and a few hours later the family was gone. I figured that the incident would cause the animals to steer clear of our yard for awhile. 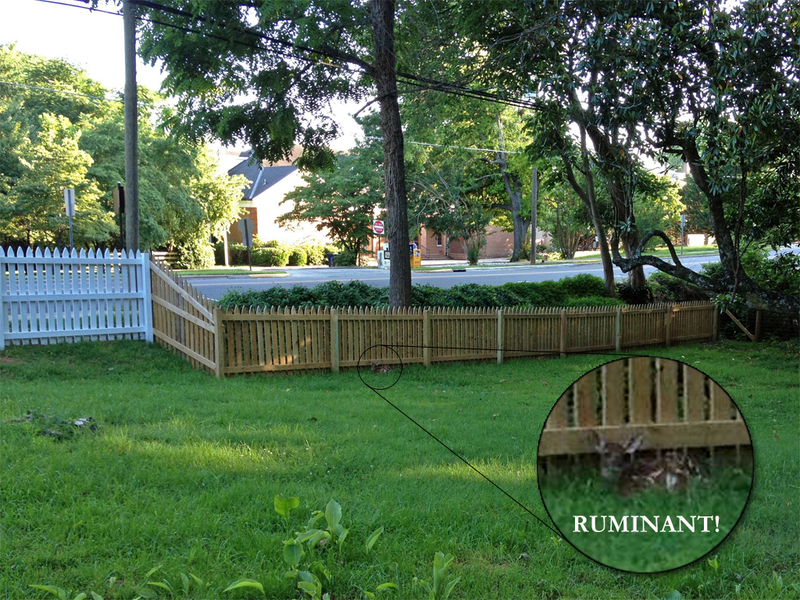 But this weekend, I was outside one afternoon and saw the same fawn quietly lounging by the fence in the front yard. Mom was nowhere to be found. I was a bit perplexed by this behavior until a little Google-ing taught me that deer daycare consists of parking your kid somewhere (anywhere will work, apparently, which explains the flat spots in the lawn), giving them the “stay put” signal, and literally high-tailing it to the nearest patch of woods. Perhaps deer like the adrenaline rush of being discovered because the fawn and its posse have visited our yard several more times over the past week. 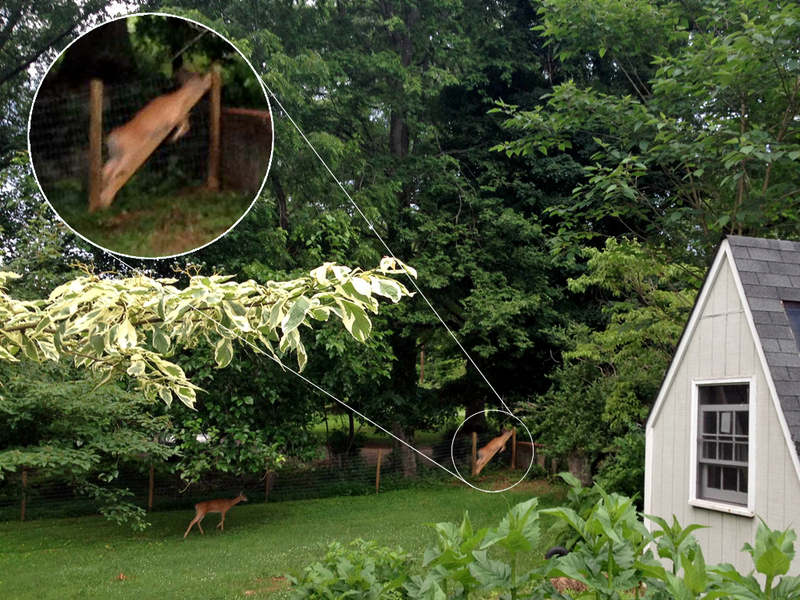 And they made it clear why deer fencing is so tall. In the picture below, I caught one of the animals mid-flight, effortlessly leaping a retaining wall from several yards away. Capable critters, yes. Smart? Certainly not. At least they don’t try to live in your attic. File this one under: if it’s too good to be true…. When we moved into the house, a small family of squirrels was using our attic as an expansive rodent residence. A bit of wood repair during our paint job blocked their entry routes, and I’ve surveyed the eaves periodically since then to be certain that they don’t return. And I thought they hadn’t. At least until I returned home one evening and observed a bushy tail flicking out the top of a chimney. Seems that at least one of the furry beasties didn’t move far, overlooking the plethora of enormous trees in our yard in favor of a carcinogen-caked brick flue. Squirrel, calmly observing my fit of rage. 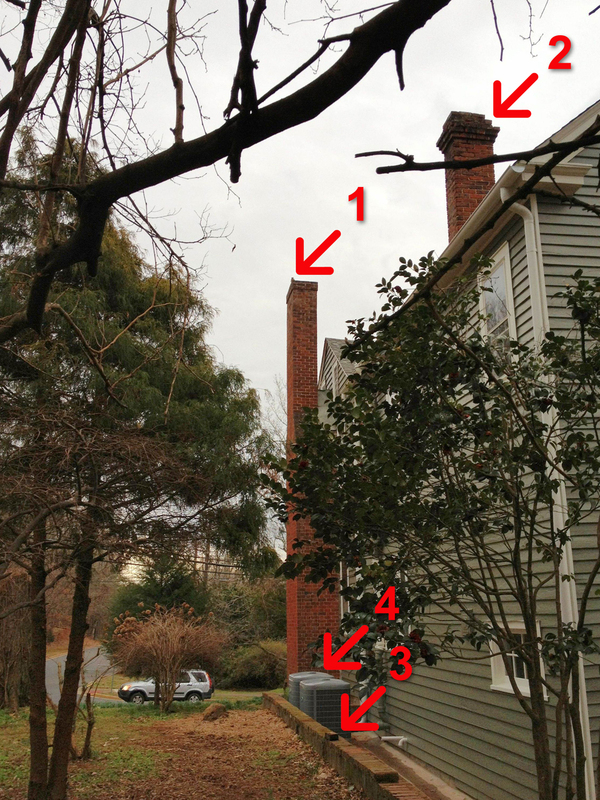 Missing brick (see #2) now on ground due to squirrel (see #1) hopping in and out of chimney. Now, I’m something of a control freak when it comes to my house and this sort of uninvited guest draws forth an unbridled fury in me that’s completely out of proportion to the magnitude of the problem. To some degree, I lost my ability to think rationally when I discovered the varmint’s presence. But in a moment of lucidity, I realized that the only clear path to the high roof was by way of some low-hanging branches on an adjacent tree. So I bought a pole saw and whacked them posthaste. Satisfied with my efforts, that evening I watched as the frustrated squirrel looked around confused at the change in his daily commute, pausing briefly before leaping 15+ feet across the gap as easily as I might jump a puddle in the sidewalk, and then springing into the chimney. Boy, did that get my knickers in a twist. The very next morning, I headed off to the hardware store to pick up a steel trap. Everything you read on the internet makes it sound like trapping squirrels is akin to shooting fish in a barrel. Set the trip plate, throw down a couple peanuts and you’ll have six or eight of the little buggers in a couple of hours. Well, the squirrels in this town must have PhDs (just like all the people), because after two weeks I haven’t caught a single one. I’ve caught two birds and put out enough peanut butter, corn, sunflower seed and cereal to feed a horse for a month. But not a single squirrel. The bait disappears and the trap trips, but no squirrels. I don’t intend to hurt the critter, I just want him to make his home elsewhere. So, I’m feeling a bit desperate and trying to strategize my next move. The chimneys need to be capped. It’s a minor miracle that they’re in such good shape after being open to 250 years of rain and snow. This is a project that was already high on my list, but I worry that if I take away the squirrel’s home without relocating him first, he might go looking for another one nearby – e.g., in the attic, by way of our newly painted trim. I wonder if I should have the tree man come chop the branches that he leaps from first. This would have the additional advantage of discouraging newcomers. Or do I call the professional wildlife people to try to trap him? Has anybody had success ridding themselves of these persistent critters, and if so, how? I’m accepting all advice and until then, if you see me throwing rocks in trees, I haven’t lost my mind, I’m just trying to convince Chip to move into the nearest available hardwood hovel.